The Drader Injectiweld uses a combination of hot tip and welding rod injection to produce high quality welds. Choose the right interchangeable tip for the job, then preplasticise the weld area and inject molten welding rod into it. The rod and the plastic being welded physically mix and become a single material. 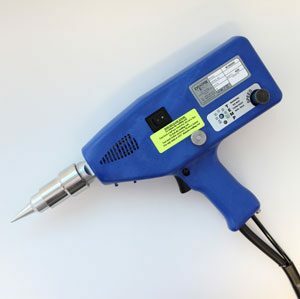 The Drader Injectiweld uses heat from the welding tip to preplasticise the welding surface of the thermoplastic. Molten plastic is immediately injected under pressure below the surface into the weld area to fuse the plastic together and form a sound weld. Since the orifice in the welding tip is submerged, surface preparation is not necessary and virtually no oxidation takes place during the welding process. The result is an efficient, quality weld, produced without using hot air or gas. The Drader Injectiweld is easy to use. Personnel new to welding can start making quality welds immediately. The one-hand operation of the Injectiweld allows the user to manipulate the parts to be welded with the other hand. This ability allows the welder to free form products for faster turnover and production. Drader Injectiweld is used for fabricating, prototyping, repair, rotational moulding and lining. Products can be designed and developed using the Injectiweld. The strong welds achieved using the Injectiweld allow welded prototypes to be used in real life tests. The Injectiweld is capable of producing welds as small as 1.5 mm for inconspicuous welds and up to 15 mm for added strength. The combination of heat and pressure from the Injectiweld produces quality welds on previously unrepairable parts, allowing them to be fixed and put back into service. The Injectiweld is utilized in various industries such as: materials handling, lining, transportation safety supply and custom repair. The combination of the heated metal tip and the high pressure of the plastic extrudate produces welds on rotomoulded parts that are water and air tight. The Injectiweld will reduce scrapped parts by sealing seams, blowholes and voids. As well, simple rotomoulded parts can be made into customer specific products with the addition of welded on fittings, baffles, flanges and various attachments. To add to the quality of these welds, we can produce custom welding rod using rotomoulded grade resin for an exact colour and material match. Whether in the field or in your shop, the Injectiweld can perform repairs and fabrications on your lining systems. Test holes, tears, seams, boots and flanges can be welded into place by using the Injectiweld.